Baked potatoes are a great side dish and can also be transformed into a full meal. Our recipe will outline how to make a perfect baked potato that is crispy on the outside and fluffy on the inside. 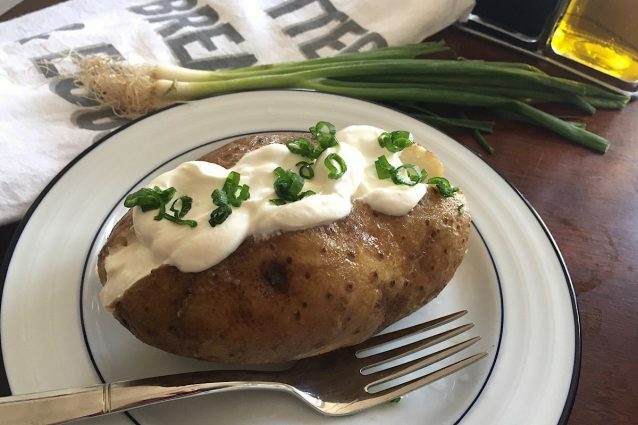 While sour cream and chives are a very traditional (and tasty) topping, you can add almost anything to your baked potato. 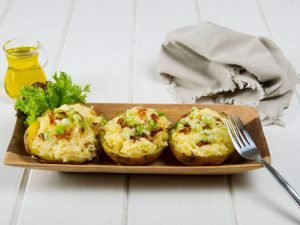 Cheese and bacon crumbles are two toppings that can help make your baked potato into a complete dinner. Whatever you top it with, you will love this recipe for its ease and wonderful flavor! Use a fork to poke holes all over the potato. This will help the potato cook all the way through. Place each potato on a piece of foil and pour 1 teaspoon of olive oil on each. Rub the potato with the olive oil and then rub the salt on the potato skins as well. Wrap the potatoes in the foil and place on a sheet pan. Bake for 1 hour and 15 minutes in a 350 ̊F oven. Allow the potatoes to cool slightly before unwrapping. Slice each potato in half and, if desired, fluff the inside with a fork. 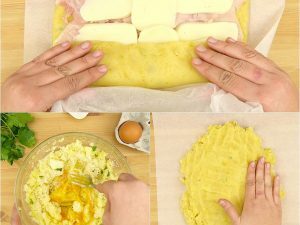 You can also leave the potato inside the skin without fluffing and simply proceed to adding the toppings. Top the baked potato with butter, sour cream and the chopped chives. Enjoy while hot! 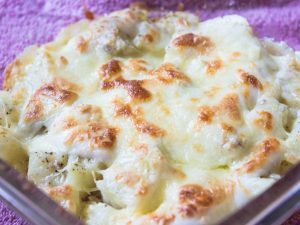 -You can bake the potatoes up to 3 days in advance. Reheat in the microwave when you are ready to eat them and then add the toppings. -You do not need to wrap the potatoes individually in the foil but can bake them on a sheet tray if you would like. Wrapping the potatoes in the foil will help keep some moisture in and help them bake more evenly however, baking them on a sheet tray will work fine.